Page under construction, come back soon! New for November 2015: contributed by Terry. This is a math derivation of the fractional distributions in a bridged-tee attenuator. Below, three current loops are defined. 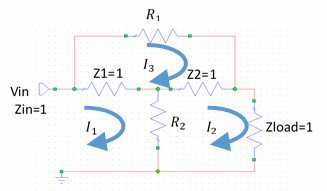 Kirchhoff's Law states that the net current into any node must be zero. The circuit is designed to be matched.